Ranch work is equal parts animal care, land management and jack-of-all-trades Western engineering. That experience came in handy for the McCoy brothers during the third episode of Season 24 of “The Amazing Race,” the CBS-TV reality series. The brothers put their ingenuity to work during the Sunday, March 9, telecast that featured the teams racing around Subah, Malaysia Borneo. Jet and Cord McCoy began the show in sixth place as the teams began from Guangzhou, China, leaving six minutes behind second-leg winners Brendon Villegas and Rachel Reilly. That was important, since only the first six teams to the airport were to be boarded on the first flight, which provided a three-hour head start to two-thirds of the nine teams remaining in the race. Of course, The Cowboys hold the valuable Express Pass, their prize for winning the opening leg that enables them to skip a challenge along the race around the world for $1 million. “We’re glad we’re the only ones to have an Express Pass,” Jet said. The McCoys were awarded two Express Passes, but one was to be given to another team. They passed it along to The Country Singers, Jennifer Wayne and Caroline Cutbirth, who used it in Leg 2. Though Villegas and Reilly held the lead to begin the race, they weren’t among the first six teams to arrive at the Guangzhou airport and were forced to wait. That put them behind the eight-ball early, and the rest of the pack took advantage. 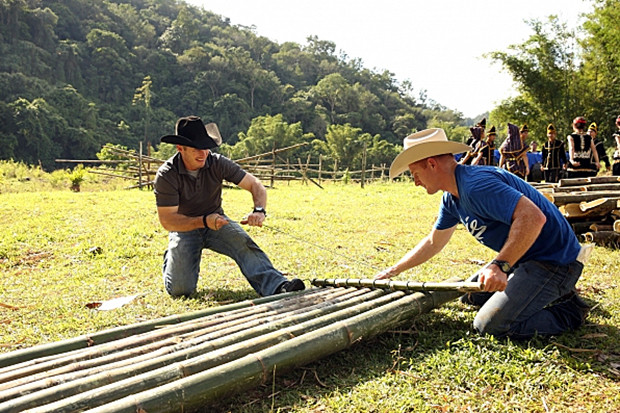 The Cowboys have done that during their three chances on “The Amazing Race.” On Sunday night’s episode, they maneuvered their way to the Kionsom Waterfall, where Cord, as the assigned teammate, had to find a gnome, then work his way through the rainforest and down the waterfall to obtain the next clue. Cord was. In fact, he attracted a little more water than the other teams because he was forced to do the task twice; the clues were along the path down the waterfall. The delay could’ve been troublesome for some, but the McCoys took it in stride. They did. In fact, it happened on the next challenge, where teams were to build a bamboo raft at the Kampung Tempinahaton to tackle one of two assignments on the Detour. The brothers from the southeastern Oklahoma community of Tupelo were fourth at the river, but they scooted past the mother-son tandem of Margie O’Donnell and Luke Adams by utilizing jack-of-all-trades engineering to create the raft. “Jet and I are kind of handymen around the ranch,” Cord said. The other teams have noticed. Third in the water, the cowboys utilized the help of The Afghanamals, Leo Temory and Jamal Zadran, to complete the Detour. Several of the teams, like The Afghanamals and The Cowboys, opted to deliver goods, while others took part in a faux hunting task. For The McCoys, they guided their raft to a make-shift port to deliver food to a village chief, and Temory and Zadran helped the brothers to their destination, though The Afghanamals were ahead of the brothers at that point. The father-son tandem of Dave and Connor O’Leary were the first to arrive at all locations along the third leg of the race, but they passed their exit point off the river. They ended up hiking back to the village chief while carrying the groceries. They hiked back and beat the other teams to the end of the Detour. That changed shortly after the teams returned to the river with their rafts. Temory and Zadran had trouble in the river, and their raft came apart in rough rapids. The McCoys, though, passed The Afghanamals on the water. That made the difference in the outcome of the second leg. The O’Learys won the leg, while the McCoys placed second. They were followed by Temory and Zadran. O’Donnell and Adams placed fourth. YouTube hosts Joey Graceffa and Meghan Camarena were the last to finish and were eliminated.